Deontay Wilder is already a fiery dude, but the WBC Champion took it to another level on Wednesday. 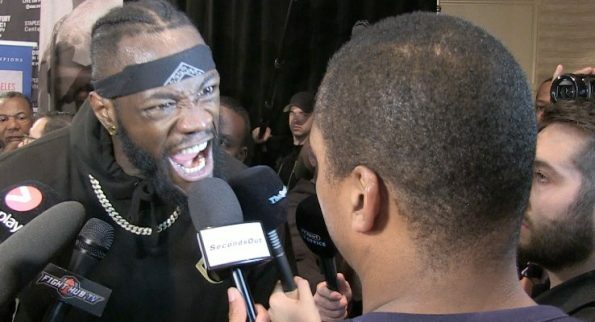 Following a press conference, Wilder launched a furious verbal response at a reporter after being asked to explain his racism comments that he made to Fury during their face-off. Wilder lost his cool with the reporter and began shouting in front of the whole room: “Your people too. Your people too. “You know what I’m talking about, you all know what I’m talking about. “Don’t sit up here and try to bait. Y’all know what the f*** I talk about when I say these things. Your people too. “I ain’t gotta explain what’s understood, Radio Rahim. If that wasn’t intense enough, Wilder then removed his glasses and stepped straight to the reporter, looking him dead in the eye as he continued to shout in his face. “How dare you just sit up there and say explain, you know what I’m talking about man.